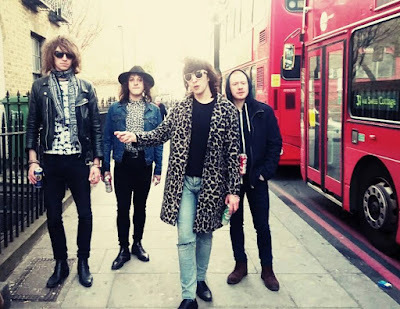 With a sound reminiscent of 70's era punk-rock, The Garage Flowers are the deliciously upbeat four-piece from London (made up of Joe Capaldi, Jonny Webber, Greg Edwards and Olly Shaw) who deserve to be your new favourite band. With their apt ability for intelligent and exceedingly witty songwriting plus an achingly cool image to match their music, brand new single 'Nothing's Gonna Get Me Down' is two minutes of gloriously raucous noise, with a quintissentially British rock and roll edge. Lyrically, it's filled with an uplifting optimism, and is perfectly executed by frontman Joes' zealous vocals. The humerous, unposed video snippets of the band featured throughout the official music video lead me to believe that they don't take themselves too seriously, and there is definitely an infectious element of fun and authenticity within the track itself which piqued my interest and really drew me to them from the offset. Instrumentally, with it's infectious hooks and memorable beats, it exudes a vibrant, melodic charm and is the perfect example of everything that this band represents- which is individuality, and an artistic zest for music. These guys are definitely one to watch out for. In life we have the many favorite personalty in life and its common thing to reach the success point.We also meet them and assignment writing help service gives the online information about the celebrities. Try to chose the good person as a guideline.